The Sanders' family piano teacher and maid testified in day two of a protective order hearing involving Deion and Pilar Sanders. The estranged couple is asking a judge to decide who gets the house and who gets the kids for now. The family’s piano teacher, Lisa Thomas, said she'd been at the Sanders' mansion the afternoon of the April 23 fight between Deion and Pilar. Thomas described hearing Pilar “scream in fear, breaking glass, a scuffle in the hallway, and then Deion shouting at Pilar, 'Get out of my house!'" Cameras aren't allowed inside of the courtroom. Heading into the hearing, Pilar's attorney, Larry Friedman said, "We expect another good day in court today. One of the people present during the April 23 incident will be testifying first thing (Friday) morning." 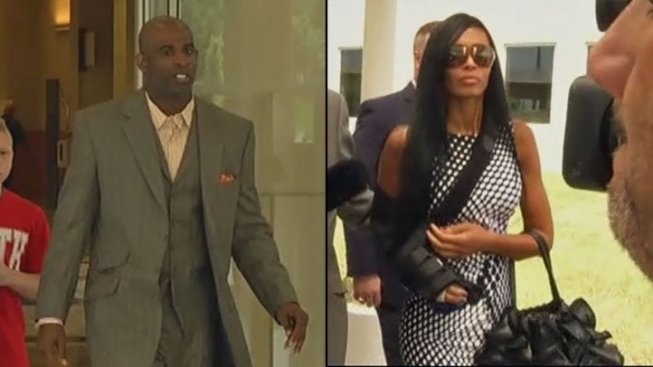 The drama surrounding the divorce of Pilar and Deion Sanders resumed in a Collin County court Friday. Pilar walked in in silence. Her attorney said she has no comment on the case. "She's strictly honoring Judge Wheless' gag order and won’t be speaking," said Friedman. "He's a good person, he does good things in the community and loves his children that’s the only reason I’m here to support him," said Sanders' ex-wife Carolyn Sanders. She has two children with Sanders. The hearing was delayed about an hour, to address another issue. Piano teacher Lisa Thomas accused Deion of threatening her in the hallway as she was preparing to testify, saying, "I'm going to get you today." Two witnesses testified that Deion only questioned why Thomas was being called as a witness. The emergency hearing lasted almost 90 minutes until the judge told the attorneys to take it up with the district attorney, if they believe Deion tampered with the witness. Thomas then testified that she's known the Sanders for nine years and claims Deion was the aggressor in the April 23 flight. She also admitted she didn't see any broken glass or any injuries on Pilar. Witnesses on Thursday testified that Pilar is the violent one. After Thomas, the family's maid Augusta Montoya took the stand. Montoya testified that Pilar had become increasingly hostile since the divorce filing and that she has spoken badly about Deion in front of their children. Montoya testified that last year she witnessed Pilar hitting her son with a belt because he wouldn't come to her. She said the boy was hiding from Pilar and that when she found him she hit him with a belt two or three times. The hearing wrapped up at 11:30 a.m., because Deion had a prior commitment. Leaving the courthouse Deion Sanders told reporters, "I have a gag order so I can't talk to ya'll. I would love to talk to you guys, I really would, I would really love to talk." When asked if he threatened the piano teacher he responded, "Oh my God." Later Deion posted on Facebook, "A desperate play at the END of the game in football is called a 'Hail Mary' A desperate play from people in yo life is called a LIE. Truth"
Attorneys are going to arrange a time over the weekend when Pilar can return to the Prosper home to get some of her shoes and other personal items. The hearing is expected to continue on Monday. The judge could make a ruling at the end of the day or delay making a decision on the protective orders.